Koodo Mobile’s latest promo offers its wireless home phone service for $5 per month for the first 12 months, dubbed as the company’s “Moving Day Offer”. The regular price for their wireless home phone is $20 per month. 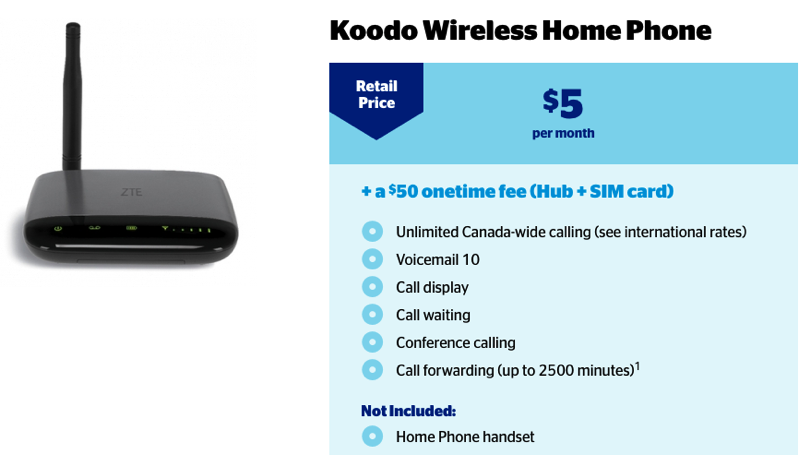 Koodo Wireless Home Phone requires customers to purchase the one-time $50 ZTE hub which includes a SIM card. Users just supply their own phone handset to plug into the hub (It can support two handsets), which you then plug into an outlet in an area with ‘good mobile reception’. Koodo Wireless Home Phone is only available in Ontario, Quebec, Manitoba, Saskatchewan and Atlantic provinces. You essentially are paying for a mobile landline that you can take to the cottage or wherever there’s an outlet and cell reception. The offer is available in-store and online. Let us know if you’re going to jump on this. The last time we saw this promo pop up was last November.